How low can Windows 10 go? 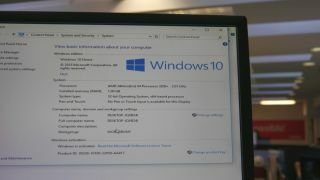 The picture above shows a computer running Windows 10. It is not any computer however, it contains a 12-year old processor, the oldest CPU, that can theoretically run Microsoft's latest OS. Anything prior to it will just throw error messages. Microsoft's decision to have a common operating system blueprint that can run from an internet-of-thing device to a (super) computer means that Windows 10 has been built from the ground up to run comfortably on low-performance parts. Note that an earlier version of this article used Windows 10 Technical preview, the current one has been updated to Windows 10 RTM. You can read our review of Windows 10 here. The fact that it shares the same minimum hardware requirements as Windows Vista (at least for the Premium experience) is a fantastic achievement but that's only part of the story; Windows 10 actually runs better than its beleaguered ancestor. Much better. We tried an experiment at TechRadar to see how low Windows 10 could go. I sourced the oldest (but probably not the slowest) processor that could run it. Microsoft says that it needs to have at least a 1GHz clock rate with IA-32 or x64 architecture as well as support for NX bit, PAE, and SSE2. The most ancient processor that fits the bill is the AMD Athlon 64 3200+, a CPU first introduced to the market in September 2003, nearly 12 years ago. It's slow (about half the Passmark score of the Baytrail-based Intel Atom Z3735G found in many entry level, sub-£100 tablets) but I chose not to underclock it further. The computer that housed it is a Mesh PC, one that comes with an Nvidia-powered Asus motherboard with onboard graphics, four 256MB DDR memory modules, a 40GB hard disk drive, a DVD ROM drive, a floppy disk drive and originally ran Windows XP. Installing Windows 10 proved to be a straight-forward task. Load it on a USB drive containing Windows 10 (you can use this Windows 7 USB drive tool) and voila! The whole process didn't take longer than on any other recent machine we loaded with Windows 10. Well done to Microsoft for maintaining compatibility with hardware that's more than a decade old. Once in, I wired the computer and downloaded the latest drivers, still no hiccups. Even with less than 1GB of RAM (64MB of it is shared with the video subsystem), Windows 10 is surprisingly nice to use, which bodes well for anyone looking to get it running on an old computer. An antiquated Mesh PC computer is the host. I deliberately chose not to run benchmarks and/or making it perform any intensive task (getting Chrome to run 40 tabs for example). Next, I halved the system memory to 512MB (448MB available) and then down to 256MB (192GB available). 256MB RAM is what the first Raspberry Pi and the iPhone 3GS (launched in 2009) ran on. The system booted without any issue which was pretty much unexpected given that previous versions of Windows (Vista and Windows 7) would often struggle to boot to the login window in less than one minute. There was no noticeable lag running the mouse cursor around, nothing like what I experienced on Windows Vista or early previews of Windows 7. However, it took a whopping 41 seconds between double clicking on a folder to open it and Windows Explorer actually showing the content of that folder. Memory usage is pretty much at its maximum. To be honest though, I am actually flabbergasted that Windows 10 runs at all on such antiquated hardware. Being able to do so is a genuinely impressive tasks given the breadth and depth of products, SKUs and components that Microsoft and its partners have to deal with.